S. C. Thompson was not as well-known as T. B. Stephenson or A. L. Walcott, but his career illustrated the same qualities of dignity, determination and commitment as did theirs. It is interesting to note the dedication of Thomas R. Thompson to his children's education, similar to that of Matthew Josephs' slave father. Sketch of the Career of Mr. S. C. Thompson. 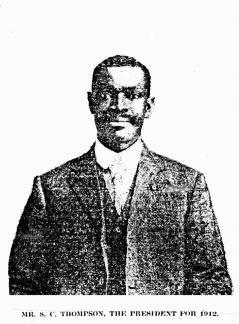 We publish on this page the photo of the President of the Jamaica Union of Teachers for the year 1912 who is Mr. S. C. Thompson, head-master of Old Harbour School. Mr. Thompson is a very successful teacher of twenty-four years standing, who commands the respect of the community wherever he labours. He is the eldest surviving son of Mr. Thomas R. Thompson of Balcarres district in the parish of Portland, one well known and respected in connection with church and other communities. Though an ordinary labourer, and a shoemaker by trade, he took a pride in the early training of his children, and he did not feel justified in allowing the school teacher to have the drudgery of the rough work of beginning. He spent his spare moments in doing this, and he succeeded well, for his eldest children were able to read from a second standard, completed a copy book and had acquired a fair knowledge of the four elementary rules of arithmetic when sent to a public school. Nor did he and his loving wife Cecelia fail to impress religious and good principles on the[i]r tender minds. Starting with these we find the present president as a boy attending Birnamwood School, and afterwards pursuing his studies in right earnest under the leadership of Mr. H. Hause, now at New Town School, Kingston. He continued here until he became a pupil teacher and afterwards entered the Mico in January 1885, taking the third place among ten. Finding that he was backwards in many respects, he settled down in right earnest to make up for lost opportunities. He succeeded admirably, and was nearly always at the head of his class, in the weekly examinations as well as the annual Government examinations, passing the third year with honours in December 1887. Apart from his energy and attainments, his conduct and character has been exemplary as the testimonials from Dr. Gillies and Colonel Gruchy tell. As a reward for these, he was retained for a fourth year as assistant on the College Staff in 1888. The whole year was not however spent here. He was offered Whitfield School at Porus, which he accepted in September, and here begins his career as an elementary teacher. He took this school at 57 marks, second class, and left it after two years and four months at 60 marks and a first class. He next took charge of St. A[u]gustines school of the same town, where he laboured for nine months, building up school and church as well to a stand[ard] it has not before or since reached and here his name will always be held dear. The average attendance at leaving was 176 despite the fact that four other schools were in close proximity. How he succeeded in laying the corner stones, and building the foundation of a school room 65' x 30', and procured the greater part of the materials for its completion by the co-operation of the entire community can only receive passing mention here. On the approach of "Amalgamation and closing of schools", he (Mr. S. C. Thompson) thought it best to accept a school elsewhere, as his position would be altered. He took charge of his present school twelve years ago where be has made a record. He found his school with an average of 89, and with 58 marks. At present the average is 160, and its marks 70. He has always been able to bring up his schools to a high standard of efficiency through hard toll. His marks have ranged between 57 and 71. In the summer of 1908 he was able to make arrangements and obtained three months leave, which was utilized in combining rest and gaining experience by visiting England, about which he has contributed several articles in the Journal of Education and elsewhere, one of which expressing dissatisfaction at the method of examination and marking by which the teacher's pay is gauged. In this visit he has succeeded in making arrangements whereby his daughter is able to have a couple years teaching in an English school.